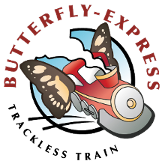 The Butterfly-Express is a true trackless train, based in Stockton California, provides service throughout the major Northern California area. Our train makes for excellent entertainment at fairs, festivals, birthdays, community, and corporate events. It can travel on grass or just about any flat surface, including asphalt, gravel, and pavement. Its powerful diesel engine pulls four canopied passenger coaches, fully equipped with padded seats, seat belts, and a sound system. Play your choice of music CDs, or have attractions and stops announced over our public address system that is piped into each of the coaches. One of our skilled drivers will act as the engineer for your tour. Your driver will always be dressed in appropriate engineer attire, providing an authentic ambience to the experience while overseeing the safety of all riders. 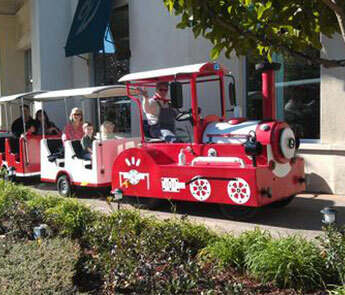 Our trackless train rides are perfect for everyone from young children to young-at-heart adults. The train measures 4' wide and 40' long, and can accommodate between 16 and 24 passengers. This is a safe and unique attraction for your special event. 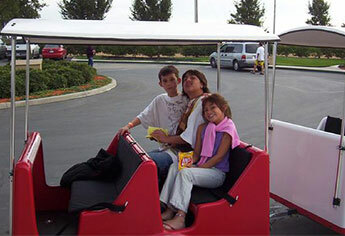 Although children love our trackless train rides, we provide services for adults as well. Reserve our train to make your next real estate tour truly memorable, giving potential clients and homebuyers a unique view of new communities, resorts, and more. The Butterfly-Express is a fun idea for corporate events, too. We offer hourly bookings in addition to pricing packages and custom quotes. Take advantage of our discounts for schools, regional organizations, and churches, or save money with our multi-hour rentals. Our prices start at $375 for the 1st hour of service, which includes your engineer, set-up, music, and operation. We ask $150 per subsequent hour of service. To get your custom quote today, simply send us an email detailing your event type, date, size, and location. We are fully insured and owner-operated. We also offer you the option of being added to our liability insurance for the duration of your rental period. The cost is $135, to be added to your total rental cost. Tours of fairs give an advantage to everyone. Events and event locations are pinpointed for easy accessibility. Seniors are aided in their visual appreciation and enjoyment of the surroundings. Children and young at heart adults, are enthusiastic about riding the train and interacting with the passing crowds of people. Vendors receive acknowledgement and important visual recognition. Corporate sponsorship is possible with sixteen 11x17 inch signage on the sides of the coaches, and a 30x30 signage location on the rear of the Train. Our coaches are equipped with canopies to provide protection from direct sunlight, padded seats for comfort and are forward facing for ease of sightseeing, seat belts for safety, and a sound system for their listening enjoyment of music, and/or our public address announcements.